South Hampstead Synagogue is a vibrant Jewish orthodox community in north London with nearly 2,000 members. 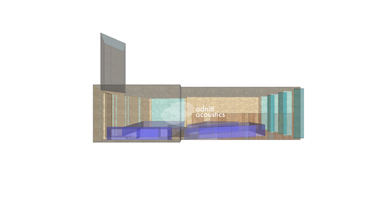 To accommodate the growing congregation and provide better facilities for the community, this redevelopment project involves the complete demolition of the existing Shul and the construction of a new 4-storey building. Make use of the sloping nature of the local roads to provide a multi-storey building that fits within the leafy green setting of this part of north London. There is a function room at lower ground level for use by members of the congregation for important celebrations, such as weddings and bar and bat mitzvots. It can also be used for extended worship space on high holy days when attendance is high. The Shul itself has to accommodate the specific requirements of the Jewish religious service, not least that the main orator faces away from the congregation and towards the front wall. This wall therefore needs to reflect sound well so that intelligibility of the service is clear throughout the hall. Above the Shul are classrooms, nursery and play areas for younger members of the congregation and community, as well as 2 residential flats for visiting rabbi. 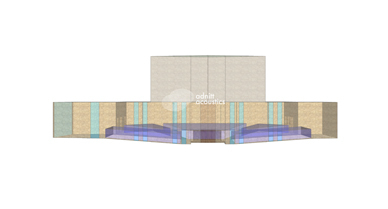 Used the resulting internal acoustic model to discuss with and advise the project's architect and client on the new building's acoustic requirements, particularly the Shul. Speech intelligibility was enhanced whilst keeping a live feeling to the Shul. Involved extensive screening of roof top plant areas. 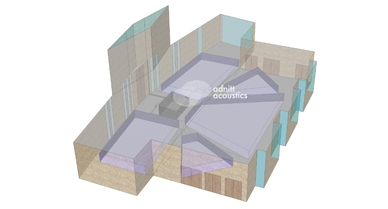 Do you have a similar acoustics requirement for your place of worship project?